To kick off cookie week, I made you these delectably soft almond flour sugar cookies that just so happen to be both paleo and gluten free. But wait! Don’t let the paleo/gf label defer you; these are some of the BEST sugar cookies I’ve ever had. The texture and flavor are incredibly similar to that of the real cookies you buy at the store. Soft, chewy, slightly cakey and a hint of almond flavor. Make sure you pack your almond flour: Pack it just like you would with brown sugar! Make sure you measure your coconut oil when it is melted. This is the best way to measure it. Also make sure that your coconut oil is NOT hot when you make the cookies. You need it to be melted and cooled so that you don’t end up cooking the egg. Let the dough sit for 5 minutes. The coconut oil will need to absorb some of the liquid, so my best advice is to let the dough sit at room temperature. Learn how to make the cookies, by watching my video. If you love it, give it a thumbs up on YouTube! Now remember, I’ll be back tomorrow with another fabulous cookie recipe. See you then! xo. 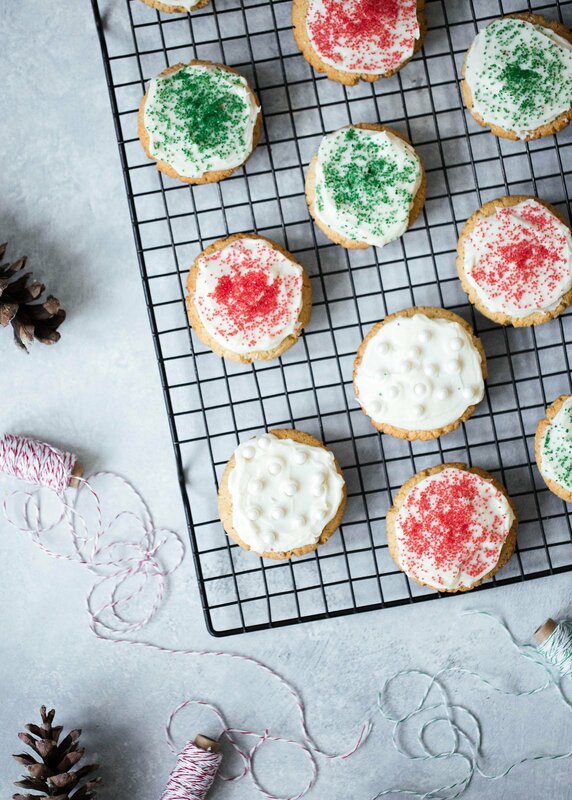 Big soft almond flour sugar cookies that taste just like the lofthouse version, except these are made with better for you ingredients. 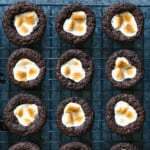 Both gluten free and paleo too (if you leave off the frosting!). These are UNREAL. almond flour, coconut flour, baking soda and salt. Process until a dough forms. Allow dough to sit for 5 minutes. You can also mix by hand or use an electric mixer, but I find the food processor to be the easiest! Next use your hands to roll dough into golf sized balls. Place on prepared cookie sheet then flatten each dough ball with the palm of your hand or use the bottom of a glass to flatten. Bake for 8-10 minutes. 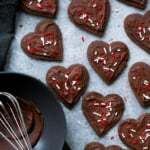 Remove from oven, transfer to a wire rack and allow cookies to cool completely before frosting. Makes about 15 cookies. For the frosting: Beat butter, powdered sugar and vanilla on high until smooth and fluffy, about 2 minutes. 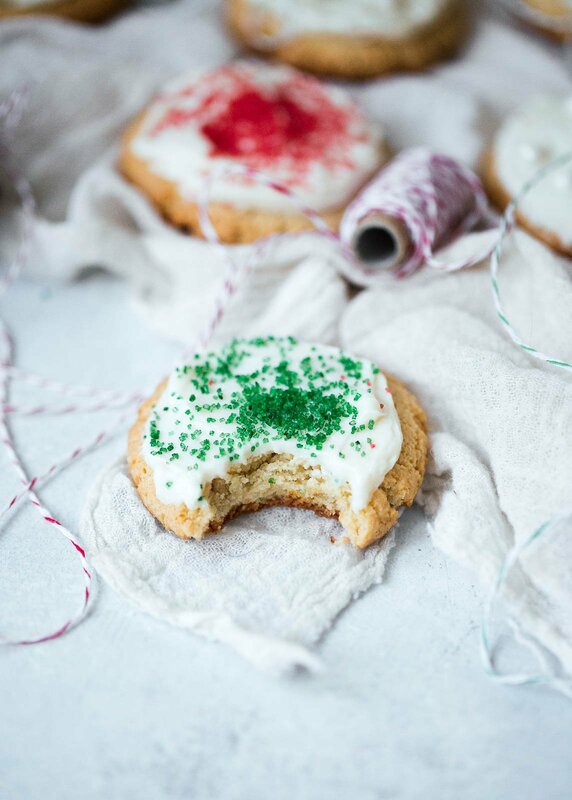 Frost each cookie then decorate however your heart desires. 72 Responses to "Soft Almond Flour Sugar Cookies with Vanilla Buttercream + video!" Sugar cookies with vanilla frosting have my full heart! 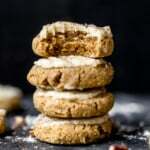 I’m obsessed with the fact that these cookies are paleo and made with almond flour aka my most favorite flour! Love these Monique!! 🙂 Cookie week is THE BEST. So cute, fun, and festive! 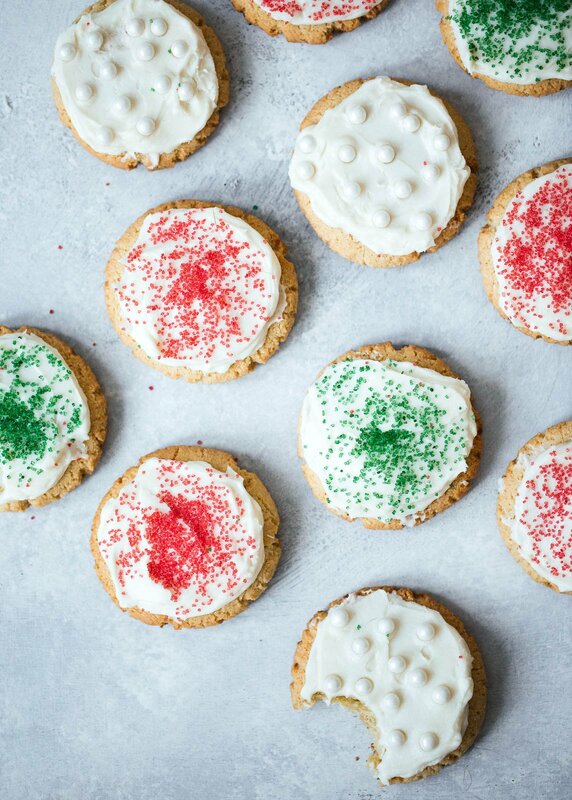 These are definitely a cookie to add to my holiday list! Once I get almond flour (ran out) I am totally making these. I love the videos! Cookie week is like, the best thing ever, right? Oh these look awesome. I have some leftover almond flour and coconut flour that I dont use very often, so I will be making these cookies today to use them up. i don’t normally make gluten free cookies (except maybe meringues and the couple of failed batches of macarons), but these sound amazing! and the dough totally looks like normal sugar cookie dough. BRILLIANT + LOVE the video! Bravo lady! these look so great!! 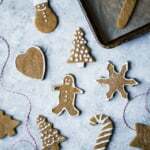 i have some celiacs on my christmas cookie plate list this year & have been racking my brain trying to figure out what to put on their plates!! these are going to have to happen. can’t wait to see more. cookie week is, like, the best week ever. These look great. Can you make cut-outs with the dough? Perhaps if you stuck the dough in the fridge for at least 3 hours, then rolled it out. I haven’t tried it so I’m not sure. Let me know if you do!!! xoxo!! Whoo hoo — thank you for sharing! These cookies look INCREDIBLE!! 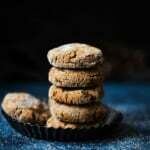 Thank you for making paleo cookies during this series – I totally appreciate it! I’m going to make these 🙂 Also – I’m loving your videos that accompany the recipe. They look stellar!! ? I made these last night and they came out perfect! They are soft, chewy, and delicious! Followed the recipe exactly except I didn’t have almond extract – which I replaced with about a teaspoon of Almond Egg Nog! I actually added about a teaspoon of the Silk Almond Egg Nog to the batter and the frosting. This cookie is too good! These looks amazing! I’ve really been enjoying the videos. Quick question: I have TJ’s almond meal onhand. Am I able to use that in place of almond flour? I’m sure it would still work if you use almond meal; they just might not have the same texture. Trader Joe’s also now sells blanched almond flour — highly recommend for that! Ok I have a question, I thought paleo was unrefined sugars? Is there an unrefined powdered sugar? Nope, that’s why these are paleo friendly. Simple Mills frosting is paleo friendly if you want to try that instead! Oh my GOODNESS. I’ve had celiac disease for about 8 years and I always missed sugar cookies this time of year. Other recipes were just disappointing! But these. Holy cow. They are insanely delicious, chewy, with a subtle hint of almond, and just dang good. Thank you so much for this recipe! It’s by far your best cookie yet! Don’t have coconut flour on hand…. Can I just use more almond flour? Thanks so much for posting! Loved this recipe as is…how do you think it would be if you replace the coconut oil with some grass fed butter? Will it change the texture? Thank you for this recipe, it’s a hit in our house. I’m sure the frosting is delicious but we love them plain. Sometimes we leave out the almond extract, add cream of tarter and roll in cinnamon sugar for snickerdoodles. Thanks again, we always love all your recipes! These cookies look amazing! I am planning to make them for a friend who is gluten and dairy free. Do you have any suggestions of what I could use to “glaze” the cookies that doesn’t include butter? 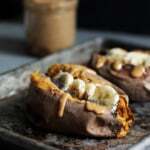 Try the cashew butter vanilla glaze from this recipe! Is there an alternative for buttercream so its more dairy free? Yes! Try soaking 1/2 cup of cashews (for about 2 hours) + 1/4 cup of maple syrup + water to thin if necessary. Blend this up! These were really good! My one suggestion would be adding lemon zest to to batter! I also made the buttercream dairy free by using vegan butter instead of regular butter. I’m so glad you enjoyed! And noted on the lemon zest – I’ll have to try it next time 🙂 Perfect with the dairy free frosting! 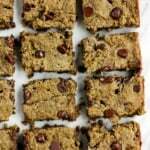 I am celiac, and love using almond flour. My kiddos and I made these yesterday and they were super easy and soooooo delicious! soft and with the hint of coconut, they were heavenly! we added food colouring to our icing (of course they needed blue and pink cookies! haha!) These will be my GO-TOs when they kids want to bake again! I’ve signed up for your email subscription, and am going to be looking through your other recipes now! thanks for sharing your creations with us! I’m so glad you found this recipe! The blue and pink sound awesome 🙂 I have tons of other recipes with almond flour, too – hope you find some new favorites! Hi Monique! Can this frosting recipe be used for cupcakes? If not, do you have a vanilla or buttercream cupcake frosting recipe? I couldn’t find one on your site. I know there are thousands of recipes out there, but I wanna start with the best ❤️ Thanks! I just found this recipe and made it with my grandson. I liked that it made only 13-15 cookies. Fun and fast and so YUMmy! Fall is in the air so we used a few fall sprinkles on top of the icing and shared them with friends. They looked great. I used grassfed butter so they had a golden hue. Amazing! Sprinkles are perfect on these 🙂 So glad everyone loved them. These cookies look amazing and I’m so excited to bring them to an otherwise gluten-filled cookie exchange! Thank you for making my first cookie exchange since eliminating gluten something I’m looking forward to. Quick question – is it possible to replace coconut flour with more almond flour? If so, what liquid needs to be eliminated? Thank you again! Absolutely the most delicious cookie ever! My favorite! Glad you loved it. I don’t have coconut flour, would 1-1 gf flour work? Or oat flour? How do you store them? The frosting is soft and I can’t stack them on top of each other! These are great, I’ve made them 5 or so times now. Something I started doing that works fantastic with these is taking the dough and rolling it in parchment, and sticking it in the freezer. That way I can slice and bake the day of an event or whatever. Also palm shortening in place of the coconut oil gives a more “butter” taste and works out just fine.